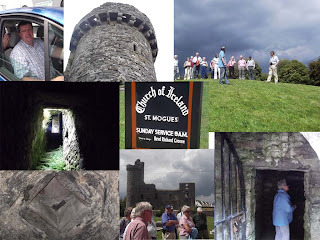 We drove on to Slade, an important fishing port in medieval times. We saw Slade castle, once owned by the Laffan family. The tower, the main building and the ruins of its 18th-century saltworks are still visible. 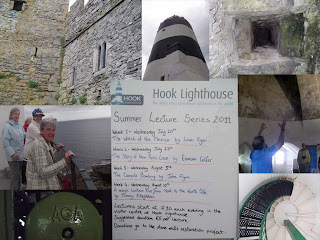 Then to the Hook Lighthouse, where we were met by one of the lighthouse guides, Liam. What made this visit unique was the fact that while Liam gave us the history of the tower, Ben gave us his own insight and memories of working on the building, as an archaeologist. 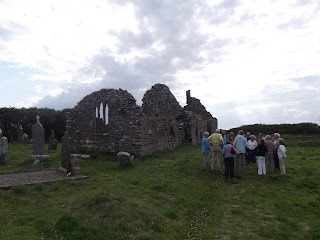 Then on to St Dubhan church, 'the most southerly church in Ireland' in its time. Now in ruins, however the graveyard is still in use, local families have kept their burial rights since the 12th century. Our last stop on the way home was Templetown church. The lands were owned by the Templars, but in the early 14th century they were handed over to the Hospitallers. 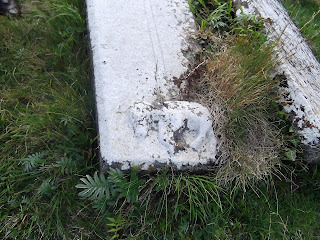 A tombstone with a lamb, symbol of the Templars, can be seen in the graveyard.